The history of Walcker organs begins with the appearance of Johann Eberhard Walcker (1756 - 1843) as an independent organ builder in Cannstatt in the year 1780. He had studied with Johann Georg Fries, an organ builder in Heilbronn. J. E. Walcker is re­membered in particular for his organs in the Garnison Church of Ludwigsburg (1782) and in the City Church of Cannstatt (1794). His son Eberhard Friedrich Walcker (1794 - 1872) took over the business begun by his father and in 1820 settled in Ludwigsburg. Further recognition was achieved by E. F. Walcker as result of technical innovations, such as his discovery in 1840 of the cone valve that ushered in the age of the stop-channel chest. He sought improvements which would result in a better and more stable wind supply. And he was the first builder to construct a large assembly room at his workshop in order to assemble the entire organ during construction. This was especially important as the number of foreign contracts continued to rise. Many respected organ builders served apprenticeships in the Walcker factory during this time, including Weigle, Steinmeyer, Laukhuff, Link, Kuhn, Sauer and Marcussen. The noted French organ builder Aristide Cavallie-Col1 and E. F. Walcker shared a close professional relationship. Cavaille-Coll, who had first learned of the cone-valve from E. F. Walcker, incorporated it successful­ly into his own organs. After the death of E. F. Walcker in 1872, the firm was mana­ged by his sons Heinrich, Fritz, Paul and Karl Walcker. They were responsible for many important instruments, including organs for the Philadelphia Exposition (1876 - 18 registers), the Cathedral of Riga (1883) 124 registers), and the Cathedral of St. Stephan in Vienna (1886 - 90 registers). At the beginning of this century, Oscar Walcker, son of Fritz Walcker, took over the family business. 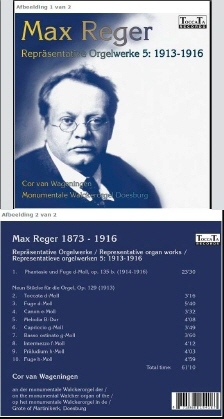 One of his first impor­tant instruments was an organ designed in collaboration with Max Reger in the Odeon Hall in Munich (1906 - 62 registers). Oscar Walcker also established an intimate exchange of ideas with the new Alsatian Organ Reform Movement headed by Dr. Albert Schweitzer. 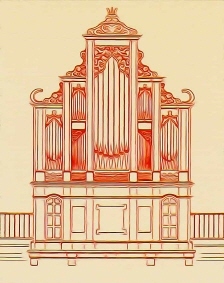 The Walcker firm built the first organ embodying the reform principles of the movement for St. Reinoldi's Church in Dortmund (1909 - 105 registers). 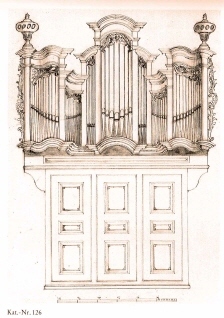 The Alsatian Organ Reform Movement had suggested that buil­ders could find a wealth of new specification and building tech­niques from the accomplishments of past centuries. Oscar Walcker was prepared to accept that challenge, and in 1921, acting on a suggestion from Willibald Gurlitt, he built a "Praetorius Organ" for the Institute of Music of the University of Freiburg. This organ was constructed according to principles laid down by the seventeenth-century composer and organist Michael Praetorius. The "Praetorius Organ" abandoned many nineteenth-century features, especially the tendency to equip an organ with a predominance of 8-foot stops in an attempt to imitate an orchestra. Instead it emphasized a specification more suited for polyphonic music as had been common in the time of Praetorius and Bach. Oscar Walcker received an honorary Doctor of Philosophy degree from the Senate of the University of Freiburg for his bold concept. The death of Dr. Oscar Walcker in 1948 marked the end of an era in the history of Walcker organs. The task of carrying on the tradition as well as rebuilding the business after the ravages of war fell to his grandson Werner Walcker-Mayer. He had served his apprenticeship under the direction of Karl Ruther, manager of the well-known W. Sauer company. Under the leadership of Werner Walcker-Mayer, the firm has produced over 3000 instruments, bringing the total number of organs built by the Walcker work­shops to nearly 6000. Some of the notable organs constructed by Werner Walcker-Mayer include those built for the Concert Hall of the Friends of Music, Vienna (1968 - 100 registers), the Salzburg Mozarteum (1979 - 41 registers), the Franz Liszt Conservatory, Budapest (1967 - 86 registers), Ulm minster (1969 - 95 regi­sters), the University of Wyoming, Laramie (1972 - 40 registers), the Concert Hall, Zagreb (1974 - 65 registers). Sao Paulo (1954, 80 registers) and Kokura, Japan (1984, 41 registers). In 1955 Werner Walcker-Mayer, in consultation with Willibald Guriitt, rebuilt the "Praetorius Organ", which had been destroyed in the war. Further interest in the history of the organ is evi­denced by his work during the 1960s concerning the Roman organ of Acquincum. 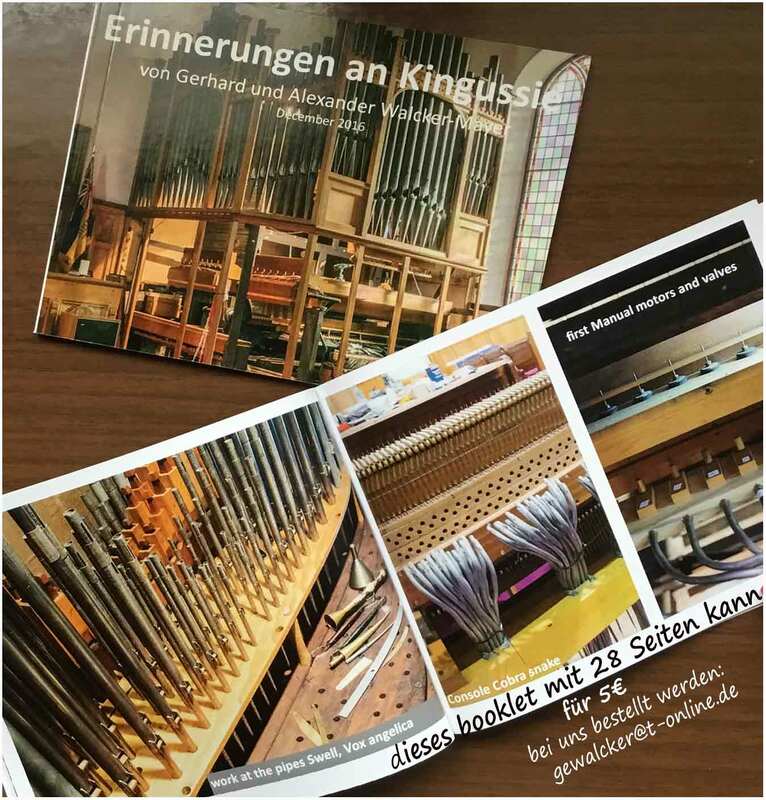 He also has undertaken significant research in the construction of church organs incorporating radical departures in stop disposition such as the organ for St. Peter's Church, Sinzig, designed in collaboration with Peter Bares. Werner Walcker-Mayer's unique combination of historical sensitivity and forward-looking creativity as an organ builder led the Senate of the University of Freiburg to confer an honorary doctorate upon himinl980. Walcker Organs can be justifiably proud of their heritage of more than 220 years of continued existence in the field of organ building. This tradition of excellence, which will be continued by the sons of Dr. Werner Walcker-Mayer.